I haven't done any consignment in years, because it's hard to produce enough yarn to have for this shop and for doing shows. But a young lady contacted me from a shop in Winston-Salem, which is in an area where 80% of the people that come to Meadows of Dan live. So I thought it would be a good idea to support a new business and get my name out more in the city by sending some yarn to her. The shop is called Nonpareil at 3560 Vest Mill Road, Suite 6, in Winston-Salem, North Carolina. Mrs. Bricker was known to her contemporaries and family as Mary Crock or, more simply, Crock. To her grandchildren and great grandchildren she was known as Brick-Brick, her son and daughter called her Mother and she was my mother-in-law. In her day, she did a bit of crocheting but was better known for her ability to teach hard science and math at high school, college and university level. During the war years, Mrs. B., along with her sister-in-law and her future daughter's mother-in-law were the math department at Beaver High School in Bluefield, WV. She earned her undergraduate degree at Queens College, Charlotte, NC in 1934 and in 2004, Dave and I took her and a classmate to their 70th Queens reunion! She earned her Masters at West Virginia University and was all but a dissertation away from her PhD when her parents became ill and needed her care. She won several fellowships including a science fellowship from General Electric and taught at Bluefield College, Bluefield State College, West Virginia University, University of Illinois, Emory University in Atlanta and VA Tech. She was extremely proud to have been chosen one of the very first cheerleaders at Tazewell High School, Tazewell, VA and would tell tales of those early days to any who would listen. 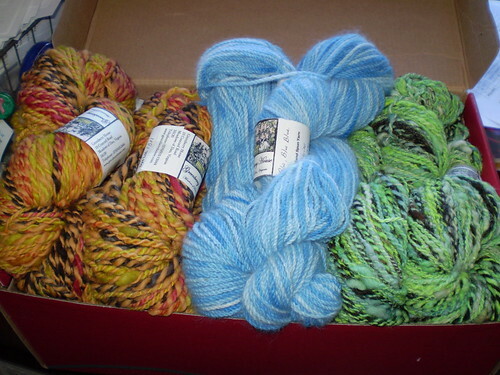 Mrs. B. supported the efforts of Fiber Femmes she knew and, in year's past, paid postage to have fifty or sixty boxes of yarn sent to The Children's Home in Siberia, Russia. She was the last of her immediate family, joining her parents, brothers and sister on 19 November 2008. 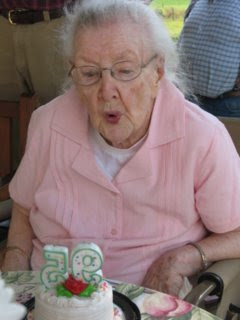 We celebrated her 95th birthday in June and all but seven of the fifty or so guests were family members including children, grand and great grands, niece, nephew, cousins and me. It was one of those rare, beautiful days...absolutely perfect weather and enough of the "old guard" in attendance to warrant a magical knowledge this was the passing of the torch. We all knew we'd never have this opportunity again and took full advantage of the day to build love and memories. We who were there have that day to hold against the dark nights and frosty world that push against love. Two Lost Arts Guild members accepted invitations to demonstrate at the New River Gorge Heritage Festival in Fayetteville, West Virginia, over the weekend of June 27-29. Despite some stormy weather and rain, both exhibitors were well-received. The hospitality of the town was delightful, with offers of shelter on neighboring porches in case of storms and a nice dinner supplied to all the Civil War re-enactors and demonstrators on Saturday. 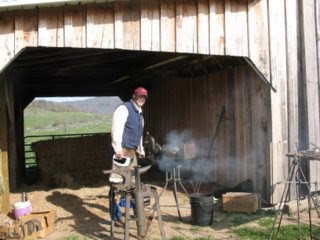 Bud Thompson demonstrated the art of blacksmithing and told stories of what a blacksmith would have done during the Civil War. Leslie Shelor spun wool on an antique upright wheel and explained what the lives of girls and women would have been like during the period. Both artisans offered items for sale to the public. Some LAG members are participating in the New River Gorge Heritage Festival in Fayetteville, WV. 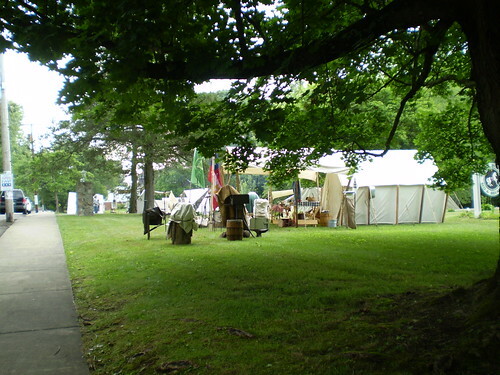 The event takes place June 27 - 29, 2008 and includes a heritage festival and Civil War Living Hisitory encampment. For more information, please contact Calentha @ the Fayetteville, WV Convention and Visitors Bureau at 1-888-574-1500 or 304-237-5608. On Monday, May 19, I traveled to Abingdon, Virginia, with a fellow member of Patrick County's Tourism Advisory Council to attent the Building a Creative Economy in Southwest Virginia conference. Sponsored by several partners, including The Crooked Road and 'Round the Mountain, the conference covered subjects such as community development and revitalizing local economies by using less traditional methods. At least, that's how it was put. By traditional they meant factories, manufacturing and economic trends of the last fifty or sixty years. But the thought occurred to me that the "new" economies we talked about, featuring artisans and farming, are going back to the real traditions of Southwest Virginia. Because Lost Arts Guild member and spinner Linda Wright is dealing with a critical illness in her family and was unable to demonstrate, I was asked to take her place in the Artisan's Marketplace. Since this was for only a short period during the day, I was able to participate in all of the sessions. It was a lively day, filled with music, interesting discussions, films and slideshows. The featured presentation by 'Round the Mountain included a film showing our own Sandra Bennett spinning on her beautiful farm in Tazewell County and talking about the planned community loop trails and Artisan Center. 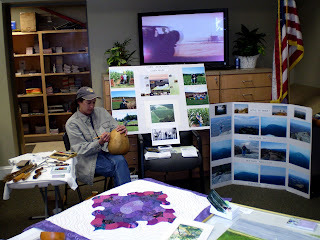 Sue Shelor was also asked to demonstrate her gourd art, and several woodworkers, a weaver, a basketmaker, dulcimer maker and stained glass artist all participated as we..
Just wanted to drop a note here that things are going well with the new season! 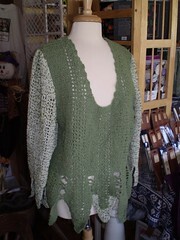 I've been very busy updating my web site and am planning to be a vendor at Sedalia Fiber Festival on May 24 at Big Island, Virginia. Come out if you're in the area. On Thursday, April 17, 2008, a group of Patrick County tourism professionals traveled to the I-77 Virginia Welcome Center at Lambsburg to promote their businesses and Patrick County. Among those involved in this event were four Tourism Advisory Council (TAC) members, the Executive Director of the Patrick County Chamber of Commerce and five members of the J.E.B. Stuart Birthplace Trust, Inc. Also involved were members of the business community that included retail establishments and bed-and-breakfast inns. 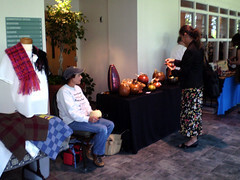 Patrick County's artisan community was also well-represented during the event. Charlotte Gardner, TAC president, represented Bull Mountain Arts with a display of artisans' work and with a quilting demonstration. Sue Shelor, of Mountain Meadow Farm and Craft Market, demonstrated gourd art and gave out brochures about her business, corn maze and festivals through the season. She also promoted the Crooked Road by giving out free demo CDs and brochures. 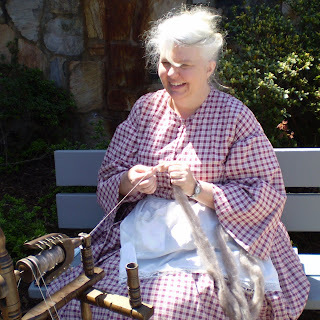 Leslie Shelor, TAC member and owner of Greenberry House, dressed in period costume and demonstrated hand spinning to appreciative travelers and gave out Patrick County brochures and business cards. Over 900 travelers and visitors to Virginia were greeted by the Patrick County group. Travelers from as far away as Quebec, Canada, Ohio, and Indiana, many of them frequent visitors to Virginia, were impressed with the presentations made by the Patrick Countians. One woman commented, "Of course we'll visit Patrick County! You are all so friendly!" Others left with stacks of brochures given out by the group and asked many questions about the events, businesses and scenic attractions available in the county. The tourism professionals that took advantage of this opportunity felt that their time was well-spent and that many of the people that they talked with would be visiting Patrick County in the future. The Virginia Welcome Centers are operated by the Virginia Tourism Corporation and offer free demonstration opportunities to Virginia organizations and businesses. For more information visit http://www.vatc.org/. 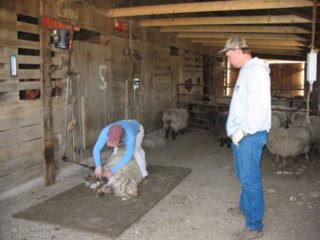 We had a beautiful day for sheep shearing; weather was sunny and bright with a crisp wind blowing most of the day. For those of us working, it was a delight but for those wandering around, jackets were tightly buttoned and hoods pulled low for most of the day. Fleeces are, again, magnificent this year and my woolies continue to produce wool that surpasses most everything I've ever seen. The whites are creamy and clear, the grays are silvery and throw sparkling light, the browns are rich and textured. 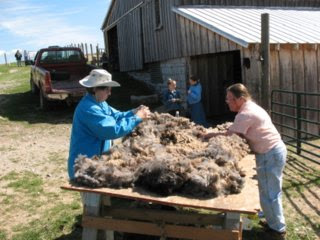 All in all, another great year for Thistle Cove Farm fleeces. Clinton Bell sheared and Daniel Miller caught the sheep. Both jobs are hard, require a lot of physical strength and seem, at times, unending but both men did a fine, fine job. LAG members had a good day. 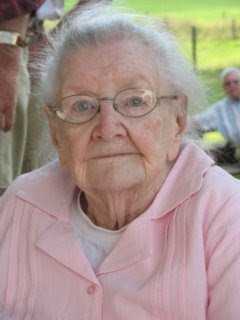 Mary Martin, basket maker, also helped skirt fleeces in exchange for me teaching her about the business. Mary has alpacas and is starting a fiber business. Her friend, Alice, on the left, also helped and enjoyed the day. Bud Thompson, blacksmith, always has good stories to tell and kept people enthralled by both story and forge. Larry Counts sold brooms as fast has he could make them; it's a good thing he had a supply to fall back upon! 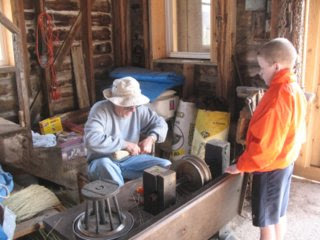 Charlie Butcher enjoyed telling people about making mountain dulcimers and even played a few tunes. Larry mentioned the Lost Arts Guild and the opportunities the guild has afforded him. I'm delighted he's pleased. When I, Sandra, started this guild, about twelve years ago, my vision was for a group of crafters who do things the "old fashioned way". I wanted us to promote/market/sell ourselves and our products as well as to promote Appalachia in an excellent light. If you read our Missions Statement and "Who We are", you'll see what we're all about and why we do what we do. All LAG members were handpicked and guild size kept deliberately small and the quality superb. That's the good news, however, at this point in time, the guild is closed to new members. Eventually, if guild members decide to have officers, terms of office, annual dues...iow, all those things that make up a "real" guild, membership could open up. In the meantime, please tell others about the Lost Arts Guild, visit our blog often and, please consider, linking to us. When you do these things, you're helping keep "the old ways" alive and well. You're also casting your bread upon the waters, bringing good karma into your lives and we all know...what goes around, comes around. Let it be good! Lag has been very rewarding for me. This is a small guild that is truley devoted to finding opportunities fo thr artisian or craftsman. They are interested in promoting southwest Va. crafters and not just getting grants or tooting their own horn. I,ve got more bang for the buck here than any org. that I,ve been associated with. I encourage any artisian in southwest Va. to check them out. It is such an honor to belong to the Lost Arts Guild! It was great to see what Larry wrote about Sheep Shearing Day; I hope I can make it next year! Sandra must be exhausted after all her hard work on the day at the farm. I hope the day was a great success! I'm looking forward to seeing what the other artisans in the guild write here; they are such talented people! I'm a gourd artist and have been selling my work at festivals, shows and other venues for five years. I joined Lost Arts Guild last year and have really been pleased with the rewards! 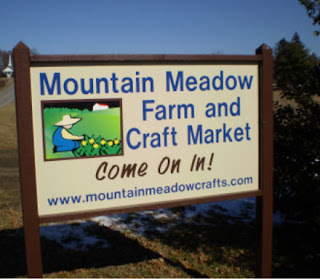 In late summer of 2007 I opened my shop, Mountain Meadow Farm and Craft Market. Our theme is "Uniting Southwestern Virginia's Artisans and Craftsmen With Local Heritage Farmers to Preserve the Traditions of Days Gone By". Some wonderful artisans are represented here using different mediums to showcase their many talents. This coming week, on Thursday, I'll be at the Lambsburg Welcome Center on Route 77 with some other Patrick County business people. Among the many folks going along is fellow Lost Arts Guild member Leslie Shelor of Greenberry House. I'll be demonstrating my gourd art and talking about the shop and our corn maze. Our goal is to promote the beautiful mountains of Southwest Virginia and Patrick County. Virginia Tourism Corporation offers any Virginia business the opportunity to promote their business or interests free at any of the ten Virginia Welcome Centers. I had a great time at Thistle Cove Farm on Sat Apr 12. Sandra B. is a great hostess and Dave is ok too. I sold parents several brooms and gave each kid a free sample.I hope I can attend next year. I can be reached at broomman24225@yahoo.com.or broomman24225.gmail.com. I am working on a web site at broomman24225.googlepages.com. check it out. It has my 2008 schedule,some bio,some pictures and some products for sale. I'll be in Honaker Va. this coming weekend. Hope to see lots of folks there. At long last the sun is out and we're looking forward to a busy, busy season up here on the Blue Ridge Parkway in Meadows of Dan. This morning a local farmer got me out of bed with "two bags full" of glorious carded Coopworth sheep's wool. I'll be dyeing and putting that out on the shelves soon. I've enjoyed the winter, although I don't know how the time flew by so fast, but I'm looking forward to fiber-filled days here at the shop! Members of the Lost Arts Guild are going to be busy this weekend at Sheep Shearing Day, which I wish I didn't have to miss! This will be the first in several years I haven't been able to attend, and I regret not getting the chance to plunge my hands deep in fresh, wonderful wool. I'm hoping for sunny skies over Tazewell. Next Thursday I'm heading to the Lambsburg Visitor's Center with several other Patrick County businesses, including Lost Arts Guild member Sue Shelor. We'll be talking about all the wonderful things there are to do in our little county and I'll be demonstrating how to spin some glorious roving made from the angora of my rabbits and some wonderful Corriedale sheep's wool. 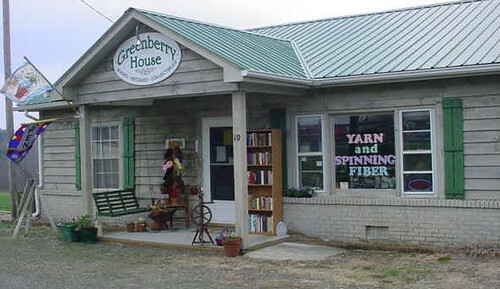 My shop specializes in hand spun, hand dyed yarns from Virginia, North Carolina and Tennessee spinners and farmers, along with roving and raw fiber for hand spinners.